It looks like the Colorado Software Summit has come to an end. In these challenging economic times, business has slowed, many companies have had to resort to layoffs and/or closures, and everyone has been tightening their belts. Unfortunately, Colorado Software Summit has not been immune to this downturn. As have so many companies and individuals, we too have experienced a severe decline in our business, and as a result we are not able to continue producing this annual conference. I first attended this conference in October 2005. I enjoyed it so much, I returned again in 2006, 2007 and 2008. As I mentioned last year, this was my favorite conference. The reason I like it so much is because it's an annual gathering (this will be my 4th year) with friends and it's somewhat like a vacation, except you get to learn a lot. While I'm sad to see it go, I completely understand Wayne and Peggy's decision. If you ever attended this conference, I encourage you to join the Colorado Software Summit LinkedIn Group. To see all my posts from the talks I attended at this conference, see my softwaresummit-tagged entries. To Wayne and Peggy: thanks for all the great memories and for putting together such an excellent conference. Cheers to you both! Last week, I attended the Colorado Software Summit in Keystone and had a great time. Not only was the weather beautiful and the food delicious, the sessions I attended were awesome. If you ever get a chance to go to this conference, I highly recommend it. It's like being on vacation and learning with a bunch of old friends. Yan Pujante also attended this conference and documents his experience, photography and presentations in Colorado Software Summit 2008. For next year, I think the conference should shorten its sessions (from 90 to 60 minutes), invite more speakers and cut the price in half (to $999 per person). How do you think the Software Summit could be improved? Subbu works at Yahoo! developing standards, patterns and practices for HTTP web languages. In the past, he was a web service and Java developer. He was also a standards contributor at BEA and an author of books on Java EE. His current passion is HTTP and REST. Subbu confesses that he's not a web developer, has no interest in the internals of programming models used for web frameworks and he's only interested in the visible aspects of the architecture. "The Web is Mostly Restful"
In the web today, some resources and URIs are personalized, but most are not. Some depend on sessions, but most do not. The consequence of a personalized UI with a non-unique URI is you cannot rely on browser caching. The web is full of different representations (HTML, XML, JS, PDF, CSS, Flash). The problem with HTML is you can't tell links that you want a particular representation based of a link. The links are hard-coded to be a particular content-type. However, some media types on responses are ignored. This is often a problem with browsers and whether the user has plugins installed. The Uniform Interface for the web is HTML and primarily links and forms (GET and POST). There's still some misconceptions (e.g. POST is secure). However, it's not about security, it's about idempotency and safety. You need to make sure you only use POST when you're changing data. POSTs are not repeatable. GET URIs are not always refreshable, which is quite unfortunate. Users shouldn't have to fight the back button. Caching is a fundamental aspect of the web. Even in a personalized site, most of the content can be cached. The web is read-only for the most part. However, many enterprise web applications don't take advantage of caching. This is fine when there's not that many users, but it's bad when you want to scale to thousands of users. There's several frameworks that use cache-busting and prefer backend caching over HTTP caching. These frameworks are not using the web like they should. Backend caching (e.g. Memcached) uses a non-uniform interface and you need to explicitly program to it. Frontend/HTTP caching has a uniform interface that's pluggable. Backend caching is generally more expensive to develop and deploy. There are cases where data should be cached on the backend, but you shouldn't focus all on backend caching w/o doing some frontend caching. With Ajax, you get more opportunities to be RESTful. XMLHttpRequest is another HTTP client that can be programmed to. It has full support for the uniform interface, which allows content negotiation, optimistic concurrency and caching. Cross-domain hacks can be done with <script> and <iframe> to tunnel requests over GET. The W3C has been working for the last two years on how to do cross-domain Ajax w/o using hacks. The problem with current cross-domain implementations is they often use GET for everything, which isn't very RESTful. Subbu recommends using a proxy on the same domain if you do need to talk to other domains. This will allow your Ajax code to remain RESTful. Web development is hard because of all the moving pieces that exist. Because of this, many web frameworks have been created to solve the various problems. In 1997, there were servlets. They provided basic plumbing and closely reflected HTTP/1.1. Servlets provided a poor programming model, but it allowed a lot of frameworks to be built on top of it. We don't use servlets to write applications, only to write application frameworks. The second era came about in 2001 when Action-oriented frameworks became popular. In 2004, JSF and friends came to play. JSF is a component-based framework with known limitations (complex, slow, uses POST for almost everything, Ajax is difficult). These limitations have resulted in a number of third-party patches being developed to solve these issues. JSF was designed to use the request to create a component tree that maintains state. Unfortunately, the state is not something the developer has control over. It's not the state of the application, it's the state of the components. The client's knowledge of the state is mentioned with a cookie and the server keeps the state in the session. The problem with JSF is you don't have a choice of state in your application - you can't write stateless applications like you can with servlets. JSF uses overloaded URIs for its resources. When you have one URI with multiple representations, there's no way to tell how a representation was chosen. JSF's compromise is to allow client-side state saving. However, they do this by putting hidden field in the form and requiring POST for navigation. Basically, these two are at opposite extremes. JSF is focused heavily on a UI component model. The people that developed it misinterpreted how the web works and made some fundamental questionable choices. You can patch it, but you can not fix it. SOFEA has a central promise of SOA. Business logic is a reusable service that changes less often. The presentation application calls those services and changes more often. The nice thing about this type of architecture is it allows a separation of concerns and loose coupling. However, it doesn't embrace REST like it should. Appcelerator is an implementation of SOFEA that has a Ruby on Rails-like usability. However, it uses a SOAP/HTTP style with messaging and POSTs to a single URI. Appcelerator is interesting, but it introduces a different style of coupling. It breaks URI opacity and client deals with POX instead of links. Don't fight the architecture of the web. Innovate and enhance instead of breaking. If nothing else, break judiciously. As developers, we should demand more from our frameworks and make sure they use the web and HTTP like it should be used. I'm sitting in Bill Dudney's talk called Core Animation on the iPhone: How to Build Animated UI's. All of the animations on the iPhone are done with Core Animation. Bill is going to start by doing a brief intro to Objective C. Objective C is a dynamic object-oriented language. It's C-based and has Smalltalk roots. Objective C is 2 files - one is a Header and one is the Implementation. They are marked with @implementation and @interface. Properties are declared with a @property keyword and a get and set method are created for you. Layers are nothing more than 2-dimensional layers living in a 3-dimensional space. You don't need to know anything about OpenGL to use Core Animation. All of the complexity is pushed behind the API and everything runs on the video card. This allows you to get really, really good performance. Core animation is actually built into Keynote on OS X and bill is showing some demos right in his presentation. You can build user interfaces on the iPhone with Views or Layers. The best way is to use a View with Layers and Events. The View listens for Events and do the right thing. There are several methods you can implement when writing a view: touchesBegan, touchesMoved and touchesEnded. These allow you to capture when a person touches the screen and they each take a set of NSSet objects, where one exists for each finger. On the iPhone simulator, you can use the Option + Mouse to simulate two fingers. Animation in Core Animation is implicit. If you change a value on a layer, the layer is going to animate that property change. They can interpolate floats and integers as well as origin (width and height). If you change colors, it'll fade between the two colors. The default animation length is 1/4 of a second. For the next 20 minutes, Bill did a bunch of live coding to show how easy it is to do animations, as well as how you can group animations together. It looked fairly easy if you know Objective-C. The iPhone OS is Unix, so you should be able to use any Unix utilities on it. The Mac is really good at drawing. Quartz is the underlying drawing framework on the Mac and iPhone. It's basically an API for Illustrator/Photoshop that allows you to programmatically do what those programs allow. Anything you can do with Illustrator/Photoshop can be done programmatically with Quartz. All of that power that's available on the Mac is available on the iPhone. The final piece of drawing technology is OpenGL. The Cro-Mag Rally game was originally written 5 years ago for the Mac in OpenGL. The creators were able to port it to the iPhone in 1.5 weeks. Bill then went into OpenGL and how you can use it to build a trackball application. Good presentation, great speaker. Even though Bill did a good job of explaining how animations work, it's obvious that you must know Objective-C to do this stuff. I can't imagine what the code behind some of the cool iPhone games (i.e. Monkey Ball, Asphalt4) looks like. Camel is a Java API that allows you to do message routing very easily. It implements many of the patterns found in Enterprise Integration Patterns. It doesn't require a container and can be run in any Java-based environment. Camel has a whole bunch of components - Bruce is showing a 6 x 10 grid with a component name in each grid. In other words, there's 60 components that Camel can use. Examples include: ActiveMQ, SQL, Velocity, File and iBATIS. Camel's RouteBuilder contains a fluid API that allows you to define to/from and other criteria. At this point, Bruce is showing a number of examples using the Java API. He's showing a Content Based Router, a Message Filter, a Splitter, an Aggregator, a Message Translator, a Resequencer, a Throttler and a Delayer. Bruce spent the last 10 minutes doing a demo using Eclipse, m2eclipse, the camel-maven-plugin and ActiveMQ. It's funny to see a command-line guy like Bruce say he can't live w/o m2eclipse. I guess Maven's XML isn't so great after all. Camel is built on top of Spring and has good integration. Apparently, the Camel developers tried to get it added to Spring, but the SpringSource guys didn't want it. Coincidentally, Spring Integration was released about a year later. Other annotations include @XPath, @Header and @EndpointInject. Camel can also be used for BAM (Business Activity Monitoring). Rather than using RouteBuilder, you can use ActivityBuilder to listen for activities and create event notifications. Bruce had quite a few folks show up for this presentation. I had trouble finding a seat because I was late. I think he did a good job of showing what Camel is and how you might use it. This afternoon, I delivered my Building Rich Applications with Appcelerator talk for the 3rd time at Colorado Software Summit. 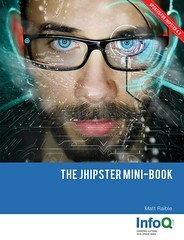 When I first proposed this topic, I hadn't used Appcelerator and saw this as a good opportunity to learn more about it. I'm glad I did. If you're going to choose Flex or OpenLaszlo, chances are you're targeting Flash. The Flash Player allows you to abstract the browser idiosyncrasies and give users a better experience. It hides the browser quirks from both developers and users. It's also a highly ubiquitous web browser runtime environment. It provides a user experience way beyond traditional HTTP request-response. Also, its visual effects and "richness" rival of non-browser desktop applications. Mark's blog stats show that 95% of readers are using Flash 9 and 1% is Flash 10. All others don't have their version exposed. Most other sources claim that Flash 9 has 98% penetration in mature markets. One of the nicest things about Flash is it frees users from limitations of traditional web applications. Request/response is largely a thing of the past and Ajax-like behavior was built-in from the beginning. Flash Criticisms: has reduced SEO as well as bookmarking and URL history support. Flash Player Criticisms: not open source, no significant alternative, no 64-bit player, loading performance and it's only useful for games, movies and annoying advertisements. The good news is Flash is getting better. There's currently a SWF Searchability initiative with Google and Yahoo!. For bookmarking and URL History, you can use "deep linking" with mx.managers.BrowserManager and mx.managers.HistoryManager. Flash Player issues are also being addressed. There's a Flash Open Screen Project, there's a 64-bit player in Adobe Labs and Flash 9/10 is much better than in the past. To prove that Flash is a compelling technology, all you have to do is look at Microsoft's Silverlight and Sun's JavaFX. These are direct competitors that are fairly new and prove that companies like what Flash has. Flex is not Flash. Flex requires Flash (9+), but Flash does not require Flex. Flex is a language and framework and applications are compiled into .swf files. Flash is the runtime environment that executes .swf files. Flex 3 is FREE. The Flex SDK, compiler and debugger are open source. They have no license costs. BlazeDS is also open source and has no license cost. Flex MXML was formerly called Macromedia XML. It's an XML-based presentation/layout language that's editable with any text editor or IDE. MXML is to ActionScript 3 as JSP is to Java. MXML provides the layout and ActionScript provides the dynamic business logic. ActionScript allows packages, interfaces, inheritance, objects and methods. It includes extensive XML Support, particularly E4X (ECMAScript for XML). It has a large class library and can talk directly to the Flash Player. Finally, it has many Java-like features and it's syntax looks similar. At this point, Dustin started doing demos of two popular Flex components: RichText Editor (which creates horrible HTML) and Data Grid. More third-party Flex components seem to appear every day. Examples include flexlib, ASDIA as well as all those listed on FlexBox. Additionally, it's not too difficult to create your own Flex components (no proof provided). Flex's property binding is one of Dustin's favorite features, but he says he has a difficult time conveying how cool it is. Property binding allows you to tie data in one object to data in another object. Updates in one object affect another. To use it in MXML, you can use curly braces or the tag. In ActionScript, you can use the BindingUtils object. You can also use Flex's metadata annotation "Bindable" to denote bindable objects. To compile Flex applications, you can use mxmlc from the command line. You can use Ant with the <exec> task or using Flex's Ant Tasks. You can also invoke mxmlc from Java as long as you include mxmlc.jar in your classpath. FlexBuilder is an Eclipse-based IDE that's not included with the free Flex SDK. It's not a free product and can be used as a plugin or a standalone IDE. There's two predominant out-of-the-box methods for Flex to communicate with Java EE backends. If the above two methods aren't fast enough, you can use BlaseDS and it's additional options. Web Messaging: HTTP publish/subscribe with JMS, ColdFusion and/or other Flash/Ajax client. Remoting with AMF: access server-side objects from Flash client-tier as if they were hosted there. Flash applications can access either a client's machine or a remote site, but not both. You can use a crossdomain.xml file on your server to allow remote Flash clients to connect. This file allows access for both Flex and OpenLaszlo applications. BlazeDS adds proxy server support for HTTPService and WebService. To use, set the useProxy attribute to "true". Features include authentication and logging. It adds a new RPC mechanisms called RemoteObject. This object allows ActionScript and Java EE transparent integration. It also adds publish/subscribe messaging with a JMS Adapter available. Lastly, it adds Ajax support to your Flex application. GraniteDS is an open-source (LGPL) alternative to Adobe LiveCycle and is similar to BlazeDS. It has COMET-like functionality and supports Spring, Spring Security, EJB 3, Seam and Guice. Flex Frameworks: Cairngorm (Adobe Consulting), Pure MVC, Mate and many others. Flex 4 (Gumbo) will have improvements for designers (easier customization, better tool support), improvements for developers (faster compiler, two-way data binding) and will leverage new features of Flash 10. OpenLaszlo 4 is XML-based and uses an XPath syntax for data access. OpenLaszlo was actually created before Flex and is ECMAScript-based. Unlike Flex that requires Flash 9, OpenLaszlo is architected to deploy on different runtime environments, including: Flash 7/8/9 and DHTML. Dustin believes OpenLaszlo would be a lot more appealing if your source code could be compiled into Silverlight or JavaFX. Dustin believes the debugger and view-source tools in OpenLaszlo are much better than the ones available for Flex. For the rest of the presentation, Dustin covered many of Laszlo's feature, how they relate to Java as well as how to integrate SWF and HTML. SWFObject is Dustin's preferred method for adding Flash to HTML. One of its nifty features is it allows SWF-to-SWF communication. This talk was an excellent and in-depth overview of Flash, Flex and OpenLaszlo. I especially liked all the details on ActionScript and the different methods for remote communication. Nice job Dustin! This morning, I delivered my What's Coming in Spring 3.0 talk for the 2nd time at Colorado Software Summit. Since there is no Spring 3.0 source code to speak of, I was unable to do the "Choose Your Own Adventure" demo at the end. The good news is I was able to easily upgrade the Spring Kickstart application from Spring 2.0 to Spring 2.5.5 (using annotations). When 3.0 is released, I hope to update this project to use 3.0 as well as show what I needed to change. If I get ambitious, I might even change the UI to use Flex or Ext JS to show a RESTful client. Below is my presentation - hope you enjoy. In this talk, Jason is going to talk about m2eclipse, Nexus, Hudson and Maven. On his Maven bullet-point, it says "The best is yet to come (and we'll fix a bunch of stuff)!" The m2eclipse plugin has improved greatly in the last 4 months - there's now 5 full-time developers working on it. If you use the m2eclipse plugin, you never have to leave the IDE for your Maven-related work. 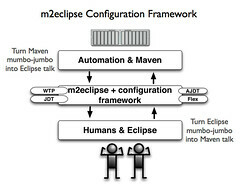 m2eclipse has a Configuration Framework that turns Maven's mumbo-jumbo (Jason's words, not mine) into Eclipse talk. 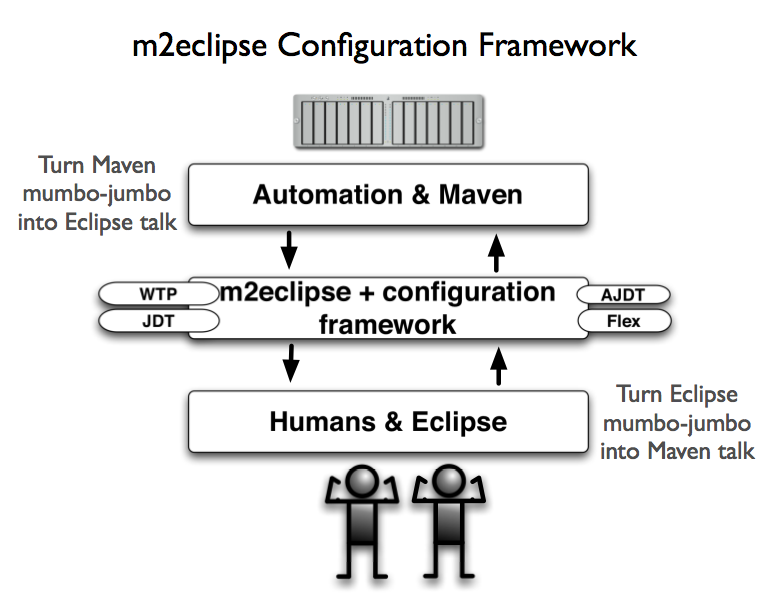 The m2eclipse+configuration framework has integration for WTP, JDT, AJDT and they're working on one for Flex. Below is a screenshot of how m2eclipse helps developers stay away from using command-line Maven. Now Jason is showing a demo of m2eclipse and creating a new Maven project from existing archetypes. It looks like m2eclipse uses "Nexus Indexer" as its Catalog. Presumably this is a Sonatype-hosted service. The Nexus Indexer contains an of Maven Central and is very fast. It's dynamically updated as new things are deployed to Maven Central. If you use m2eclipse and open a pom.xml, you'll get a visual view rather than an XML view. This UI has tabs for Overview, Dependencies, Repositories, Build, Plugins, Reporting, Profiles, Team, a Dependency Hierarchy and Dependency Graph. You can easily add new dependencies and it finds things quickly because it's using the Nexus index. In addition to visually adding dependencies, you can modify the raw XML and get things like groupId and version code-completion. Once you have your dependencies listed in a "Maven Dependencies" container to you can "Materialize Project" to create a project from the binary dependency. You'll get the source as a new project in your workspace as well as having your binary dependency turned into a source dependency. You can easily create a run configuration that runs certain goals, allows you to activate profiles and uses an embedded version of Maven or an external installation. I asked Jason if the Dependency Hierarchy had a right-click -> exclude feature and he said it doesn't exist yet, but it will in the release after next. For now, the pom editor is just eye candy and doesn't have actions. For Maven Plugins, m2eclipse has workspace resolution so you can develop a plugin and use it in a project at the same time w/o having to install the plugin over and over. Sonatype has created a Project Materializer Plugin that allows a team lead to create a project for developers. It allows you to create a welcome page that has links, cheat sheets, News and Updates and Tasks for the developer. It also materializes Eclipse projects in the background. Cheat Sheets are a series of tasks that can be run to show developers how to do things. Another big feature in m2eclipse is nested project support. It only works in Eclipse 3.4 though. Nexus is a repository manager that allows you to keep the cruft from the outside world out of your system. It's primarily for Repository and Configuration Management. It has fine-grained security for authentication and authorization. One nice feature of its security system is you can prevent certain users from seeing source JARs. It also has virtual repositories (a savior for OSGi lovers). UI is written in Ext JS and acts as a simple REST client for Nexus. It has a full REST API using RESTlet. A repository manager allows you to protect yourself from the Open Source Ghetto. The OS Maven Ghetto has bad POMs, repositories in POMs, mixed snapshot and release dependencies and screwed up metadata. Not only does it offer protection, but it allows you to aggregate repositories and publish your internal artifacts to it. It also allows you to schedule tasks that clean out snapshots so your repositories don't grow out of control. Typically people deal with OSGi runtimes manually. OSGi can dynamically update dependencies that you drop into your bundle repository. However, many folks maintain their OSGi runtime and bundle repository locally. Some people are trying to get an OSGi runtime to resolve against a P2 repository. P2 is what Eclipse uses for their repository management. Nexus has the ability to lock down the versions that are available to an OSGi runtime. Furthermore, you can use Nexus to manage the versions that get deployed to all your servers. This makes it a lot easier for QA and Production to manage versions of your artifacts. OSGi is great for modularity and solving classpath issues, but it does have issues with versions and how its ranges work. You can see Nexus in action at http://repository.sonatype.org. It can be configured entirely through the UI, an XML file or through the REST API. RSS feeds exist for configuration and repository updates. Nexus is free and open source with a GPL license. The next version (1.2) will contain a Plugin API to allow extensions. All of Sonatype's enhancements for its commercial version will be written as plugins. A matrix of what's available in the open source version vs. commercial version should be published sometime next week. They've also enhanced Hudson so it can easily test/publish Maven projects without using the free-form project template. Hudson works well for doing Eclipse headless builds for Eclipse plugins. If you need to test against multiple databases, multiple OS's, it does support a grid-based system that's easy to setup. Hudson does have web services integration that allows you to kick off builds from within Eclipse. Sonatype uses Hudson to run all their nightly builds of Maven. Refactored Project Builder: includes a spec for building a pom, domain-specific parsers (attribute-based XML, Groovy and Ruby) and mixins. Mercury: a new repository and transport layer. Developed by the Jetty people and is super fast (async client with connection pooling and parallelization). Has atomic downloads and deployments (with Nexus), full PGP support and a WebDAV client built-in. Maven Embedder: re-written to actually work. Overall, a good talk with lots of demos. I'm definitely looking forward to Maven improvements in the future. This week, I'm attending the Colorado Software Summit in Keystone, Colorado. Below are my notes from an OSGi at LinkedIn presentation I attended by Yan Pujante. LinkedIn was created in March of 2003. Today there's close to 30M members. In the first 6 months, there was 60,000 members that signed up. Now, 1 million sign up every 2-3 weeks. LinkedIn is profitable with 5 revenue lines and there's 400 employees in Mountain View. Technologies: 2 datacenters (~600 machines). SOA with Java, Tomcat, Spring Framework, Oracle, MySQL, Servlets, JSP, Cloud/Graph, OSGi. Development is done on Mac OS X, production is on Solaris. Front-end has many BL services in one webapp (in Tomcat). The backend is many wars in 5 containers (in Jetty) with 1 service per WAR. Production and Development environments are very different. Total services in backend is close to 100, front-end has 30-40. 1 WAR with N services does not scale for developers (conflicts, monolithic). N wars with 1 service does not scale for containers (no shared JARs). You can add containers, but there's only 12GB of RAM available. Upgrading back-end service to new version requires downtime (hardware load-balancer does not account for version). Upgrading front-end service to new version requires redeploy. Adding new backend services is also painful because there's lots of configuration (load-balancer, IPs, etc.). Is there a solution to all these issues? Yan believes that OSGi is a good solution. OSGi stands for Open Services Gateway initiative. Today that term doesn't really mean anything. Today it's a spec with several implementations: Equinox (Eclipse), Knoplerfish and Felix (Apache). OSGi has some really, really good features. These include smart class loading (multiple versions of JARs is OK), it's highly dynamic (deploy/undeploy built-in), it has a service registry and is highly extensible/configurable. An OSGi bundle is simply a JAR file with an OSGi manifest. In LinkedIn's current architecture, services are exported with Spring/RPC and services in same WAR can see each other. The problem with this architecture comes to light when you want to move services to a 2nd web container. You cannot share JARs and can't talk directly to the other web app. With OSGi, the bundles (JARs) are shared, services are shared and bundles can be dynamically replaced. OSGi solves the container challenge. One thing missing from OSGi is allowing services to live on multiple containers. To solve this, LinkedIn has developed a way to have Distributed OSGi. Multicast is used to see what's going on in other containers. Remote servers use the OSGi lifecycle and create dynamic proxies to export services using Spring RPC over HTTP. Then this service is registered in the service registry on the local server. With Distributed OSGi, there's no more N-1 / 1-N problem. Libraries and services can be shared in one container (memory footprint is much smaller). Services can be shared across containers. The location of the services is transparent to the clients. There's no more configuration to change when adding/removing/moving services. This architecture allows the software to be the load balancer instead of using a hardware load balancer. Unfortunately, everything is not perfect. OSGi has quite a few problems. OSGi is great, but the tooling is not quite there yet. Not every library is a bundle and many JARs doesn't have OSGi manifests. OSGi was designed for embedded devices and using it for the server-side is very recent (but very active). OSGi is pretty low-level, but there is some work being done to hide the complexity. Spring DM helps, as do vendor containers. SpringSource has Spring dm Server, Sun has GlassFish, and Paremus has Infiniflow. OSGi is container centric, but next version will add distributed OSGi, but will have no support for load-balancing. Another big OSGi issue is version management. If you specify version=1.0.0, it means [1.0.0, ∞]. You should at least use version=[1.0.0,2.0.0]. When using OSGi, you have to be careful and follow something similar to Apache's APR Project Versioning Guidelines so that you can easily identify release compatibility. At LinkedIn, the OSGi implementation is progressing, but there's still a lot of work to do. First of all, a bundle repository needs to be created. Ivy and bnd is used to generate bundles. Containers are being evaluated and Infiniflow is most likely the one that will be used. LinkedIn Spring (an enhanced version of Spring) and SCA will be used to deploy composites. Work on load-balancing and distribution is in progress as is work on tooling and build integration (Sigil from Paremus). In conclusion, LinkedIn will definitely use OSGi but they'll do their best to hide the complexity from the build system and from developers. For more information on OSGi at LinkedIn, stay tuned to the LinkedIn Engineering Blog. Yan has promised to blog about some of the challenges LinkedIn has faced and how he's fixed them. Update: Yan has posted his presentation on the LinkedIn Engineering Blog.